Passage statistics: 16 hours difference between Japan and Aleutian time. We arrived at first light in 15 Kts of wind and dense fog directly into the harbor entrance. Just inside the narrowing entrance the sun broke through exposing green hills, tall blown out volcano crater, a rusty half sunken WW2 Japanese ship haunting the anchorage area, calm water and hundreds of birds. Stunning coastline, cliffs of green rocks, a gavel beach with gentle lapping morning waves. All absolutely stunning! No sooner had we dropped anchor and did our high fives and hugs, Tara, the Netherlands boat that was closest to us the entire passage dinghied over and said they and the French boat in the east bay were departing in a few hours due to the easterly blow moving in on Sunday. Not wanting to be trapped so far out westward we decided to buddy boat with them. 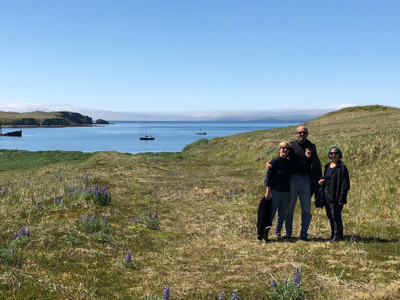 Tara took us ashore to stretch our legs and hike the beautiful tundra. WW2 relics litter a hillside. Japanese battle guns, tractors , shell casings, and rotting remains of the army encampment. We spent 8 hours admiring the island, basking in the warm sun and total silence with exception to the birds calling out. Three boats are now motorsailing to Adak, 220 miles east of Kiska; planning to arrive before the easterly blow sets in driving waves and opposing current. We will seek shelter in Bay of Islands on the west coast. Spend a few leisurely days hiking around the hills and streams. Too many places to see and visit so we try to choose the best weather and sometimes we have to make scarcities. This is sailing and cruising. We have safely arrived in Gertrude bay, Kiska. More details later but for now we’re thrilled and ship shaping Konami. 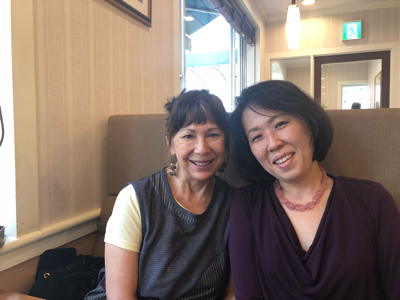 A Dutch sailboat, Tara is here with us, part of the migrating group from Osaka. 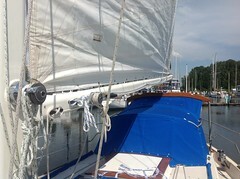 Motor sailed 95 miles noon to noon. Knowing going faster would put us in Kiska at midnight we slowed down and saved fuel. The sun treated us all day with warm (50*), calm sea, beautiful patches of blue breaking apart the monotonous grey clouds. 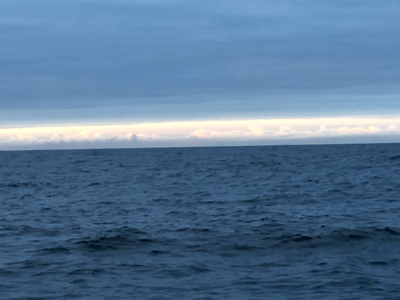 Our last leg of this passage is ending with 15 kts of wind just aft of our beam, we have been sailing since 17:00 – (5:00 p.m.) and forecasted to last through the early morning hours. A very befitting way of celebrating our efforts. Currently we are about 25 miles out, approximately 5 hours from Gertrude Bay. We plan on celebrating with a delicious breakfast, not oatmeal either, and a hot mug of coffee sitting at the calm table, not chasing our dishes. We will post again when we are safely anchored. Keep up the rah rahs for us, greatly appreciated! Current position: 51 05N. 174 48E 133 dragging miles to go. We have been motor sailing in 5kts of wind with a long Westerly swell for 30 hours. We will be changing our time zone back to Hawaii-Aleutian time, 6 hours earlier than U.S. west coast time in about 12 hours. The nearly full moon will be directly overhead in a couple of hours and breaking dawn in in three hours. The moon will disappear before we see it set. It’s rather confusing to our body clocks as Sleep and Hunger sensations argue with each other. The difference between ocean and sky was very apparent today. We haven’t seen an actual orange glow sunrise or fiery sunset for a few days. The horizon has been one massive canvas of the same dull blue-grey color, 360 degrees. We watched a whale surface, spout and dive waving his giant tail at us about a half mile from the boat. An amazing sight each time we see it happen! Konami and crew are doing very well, ready for this long passage leg of our Alaskan journey to be completed. Good evening/morning to all of our family and friends! Day 12 : June 26 17:45JST. 50 17N 171 36E, 250 miles from Kiska. 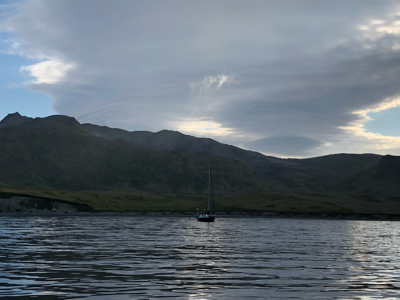 Konami is now motor-sailing in 8 kts north wind, We planned on Attu being our first stop but the big front and continuous northerly winds changed our course line to Kiska, 166 miles east of Attu. 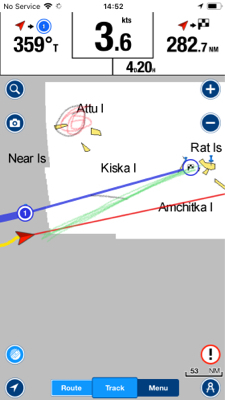 Two other boats have also changed to arriving in Kiska, they are about one day ahead of us. The French boat with the fish net entangled in the propellor arrived in Attu last night, we haven’t received an update to their prop fix. We’re disappointed to miss Attu but fighting our way back in the north wind just doesn’t seem feasible. 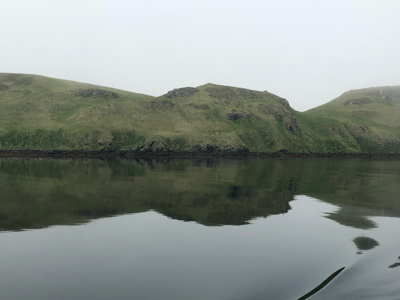 Up side is we will have the opportunity to visit a couple of other islands on the way to Adak as long as the weather permits additional stops. This year’s weather seems to be unusual with all the pressure gradients coming all the way to the Aleutians for extended periods. The North Pacific high isn’t strong enough to keep them at bay. 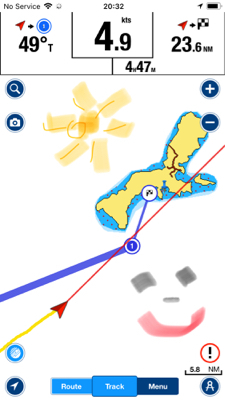 We hope to arrive in Kiska Anchorage by Thursday evening but may slow down to avoid arriving in the dark. It’s s long way to motor, we calculated 44 hours of motoring in very light winds. We have enough fuel on board to arrive in Adak, our first fuel stop. Diesel is $3.45/gallon according to the other boats that went in and departed. So turn on the engine heater, put away sleeping hats and gloves, we’re toasty and comfortable. It’s been 3 days since the front blew through and the seas are still choppy. The wind was suppose to have lightened but we had 20 kts most of the day gusting 25 pushing us considerably south of our course line. 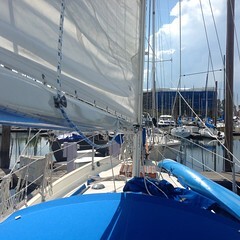 Even with a triple reefed main, storm jib and furled yankee just a bit larger than the storm jib we were doing 6 kts. John is doing well other than extremely cold as I am under the blankets with a migraine. 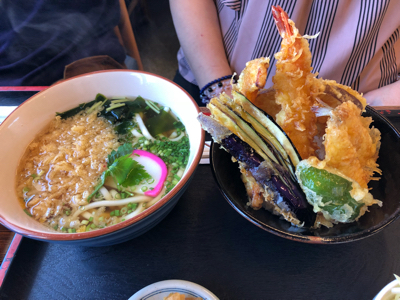 We are missing good Japanese cuisine. Can’t wait to get into a calm Anchorage and pig out! Hanging in there, wish us calmer steady winds 15 points behind the starboard beam. Day 10: 12:30 JST: current pos. 49 30N 165 16E, +- 490 miles to go. When it’s bad out don’t ask. 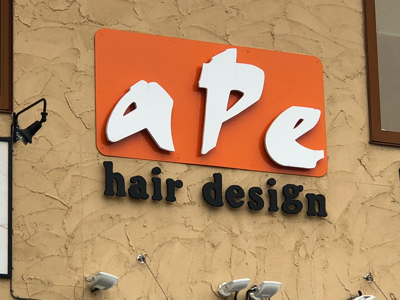 Irritated, a few choice words, some minor annoying boat issues to fix upon arrival, and the overwhelming desire to be beamed into outer space makes Bad. The 4 other boats out here are doing about the same. Some bad, some good. The French boat has a fish net wrapped around one of the propellors but they can make it to Attu and will dive on it there. Burr, poor guy. 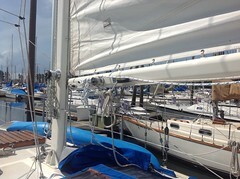 Another boat had the furling line break-sending them scrambling to get a wild flinging sail down to deck. 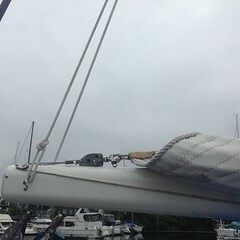 We lost our main halyard during a sail change, it is now firmly snugged up at the top of the mast. Fortunately we had a spare rigged. A quick trip up the mast when we get into a “calm” Anchorage. But we made it out of the pressure gradient a little wiser. The 4 meter seas were overwhelming, 24 hours later the sea lay down to manageable sailing conditions. 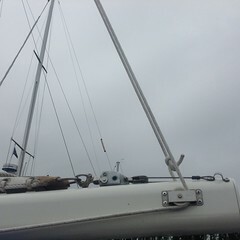 We’ve been ghosting along in light fog and blueGrey sky at a mere 4.3 kts. The wind just now picked up to 15-17 kts., currently sailing @ 6.0 kts in 1m waves. We anticipate decent sailing for tonight, maybe 24 hours before coming into a no wind zone. Hope to continue in great sailing conditions to the Aleutians.